Questions remain about the strategies that can best reduce diversion without increasing ED crowding and how best to coordinate these efforts. In the Western Journal of Emergency Medicine, Dr. Delgado and colleagues had a study published that systematically reviewed simulation model investigations. “Our overall goal was to gain insights on how to optimally reduce ambulance diversion,” Dr. Delgado says. 1. Adding holding units for inpatient boarders. 2. Adding ED-based fast tracks. 3. Improving lab turnaround times. 4. Smoothing out elective surgery caseloads. “The desired effect of reducing ED waiting room times by diverting ambulances is likely to be very small,” says Dr. Delgado. “We also found that if diversion is used, the decision to divert should be made based on the number of patients in the waiting room or number of ED boarders instead of just a lack of inpatient beds. Smoothing elective surgical admission caseloads is a dynamic bed management strategy that would likely reduce ambulance diversion and could increase hospital revenue.” Implementing regional cooperative agreements among hospitals is another promising avenue for reducing diversion. Delgado MK, Meng LJ, Mercer MP, Pines JM, Owens DK, Zaric GS. Reducing ambulance diversion at hospital and regional levels: a systematic review of insights from simulation models. West J Emerg Med. 2013;14:489-498. Available at: http://escholarship.org/uc/item/41g6m81s.pdf. Burt CW, McCaig LF. Staffing, capacity, and ambulance diversion in emergency departments: United States, 2003-04. Adv Data. 2006:1-23. Pham JC, Patel R, Millin MG, et al. 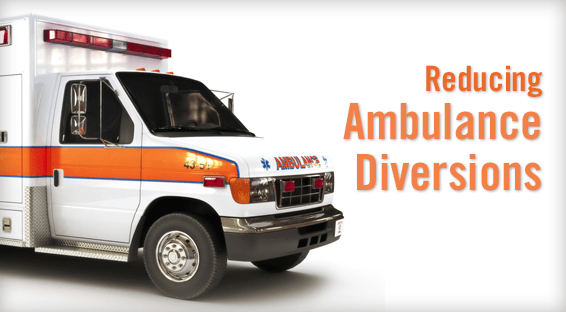 The effects of ambulance diversion: a comprehensive review. Acad Emerg Med. 2006;13:1220-1227. Handel DA, John McConnell K. The financial impact of ambulance diversion on inpatient hospital revenues and profits. Acad Emerg Med. 2009;16:29-33. Hoot NR, Leblanc LJ, Jones I, et al. Forecasting emergency department crowding: a prospective, real-time evaluation. J Am Med Inform Assoc. 2009;16:338-345. M. Kit Delgado, MD, MS, has indicated to Physician’s Weekly that he has received grants/research aid from the National Institutes of Health and the AHRQ.